1.5L 4-cylidner 130 hp 114 lb-ft.
Advanced airbags, ACE body structure, rearview camera. Honda Magic Seats, 95.7 cu-ft. interior volume. Vehicle stability, brake assist, cruise control, Magic Seats. Compact vehicles can often times be stuffy and ill equipped, feeling more like something similar to a car rather than a real vehicle. The 2016 Honda Fit in Ponca City, OK breaks this mold with a sporty engine, high safety rating and great technology and convenience features. There are few compact hatchbacks that offer nearly as much versatility as the Fit. The seating and flexibility of the interior alone set it apart from the segment. What makes the interior of the Fit so ideal are the Honda Magic Seats. With four different modes, the seats can handle an incredibly wide variety of cargo and passengers. You will find yourself fitting items that you never thought would go into a compact space. Whether you have a tall or long box, or an odd smattering of weirdly shape pieces, there is a configuration that will allow it to Fit, proving that Fit isn’t just an easy name to remember. 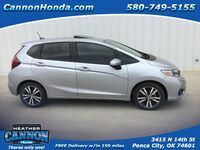 Interested in a 2016 Honda Fit? The Honda Fit offers an ideal fuel economy at an EPA rated 33 city and 41 highway mpg. This is achieved thanks to a mixture of a lightweight body and a continuously variable transmission that offers a smooth and quiet drive. The engine is equally impressive. This four-cylinder produces 130 horsepower and 114 pound-feet of torque. Drivers that like to feel a bit more connected to their vehicles can also find the Fit with a manual. This performance would mean little if the vehicle wasn’t very safe, fortunately it is. This is thanks to the ACE body construction, advanced airbags, vehicle stability assist, traction control, brake assist and much more. The Fit also comes standard with convenience features like tire pressure monitoring, daytime lights and a rearview camera, keeping you aware of your car and surroundings.